With over 350 exhibitors from over 30 different countries, the 17th edition of Pumps & Valves at the Antwerp Expo Centre was another record edition. The exhibition is the most important Belgian meeting for pumps, valves and industrial processing of liquids and gases. 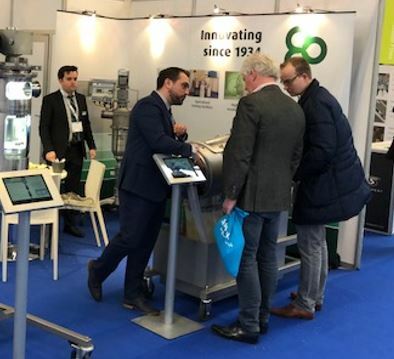 Over 5,100 visitors from the food, pharmaceutical, chemicals and cosmetics industries visited the fair to see the latest innovations and trends in industrial processing equipment. Together with Pumps & Valves, Maintenance 2018 took place, showcasing the latest in production-related maintenance. 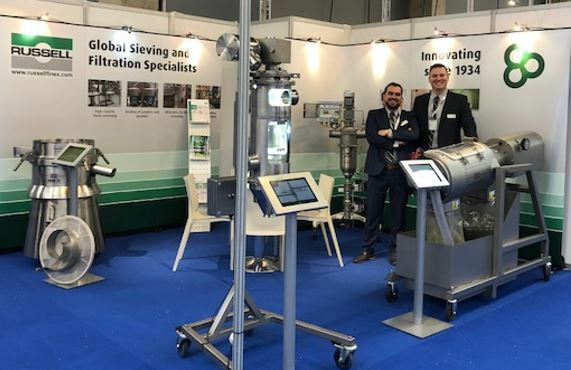 Russell Finex presented a wide range of high-performance sieving and filtration equipment for the industrial processing industry. Pumps & Valves also offered many additional events during the show. Visitors and exhibitors could partake in different key note speeches, masterclasses, award presentations and tours. Russell Finex contributed to the Digital Innovation Tour, a route of live machine demonstrations, to emphasize the exceptional quality of Russell equipment. Experienced sales engineers were available to discuss improvements to existing and future production lines, and visitors could see live demonstrations of the high-performance Russell Liquid Solid Separator™ and the Self-Cleaning Russell Eco Filter®. Visitors were also able to learn more about the innovative Finex 22™ Sieve. If you were not able to see Russell Finex at Pumps & Valves 2018, you you will have another opportunity at Solids Antwerp, stand B050 from 17 – 18 October 2018. Contact Russell Finex if you have any queries or need more information about the innovative range of industrial separation equipment.